Peptic ulcer, also known as stomach ulcer, is a break in the lining of stomach, first part of the small intestine and sometimes in the lower esophagus. Gastric acid is well described as the cause of peptic ulcer, while Helicobacter pylori infection is recognized as the major causative factor in ulcer formation. The bacterium causes stimulation in the production of gastric acid due to gastritis, and this cycle contributes to erosion of the mucosa and ulcer formation. In addition, imbalance between offensive factors (excessive gastric acid, H. pylori, gallbladder fluid, and elevated free radicals) and defensive factors (mucosa, blood fluid, prostaglandins, and antioxidants) may also lead to peptic ulcer. Therefore, the effective first-line treatment is antibiotic therapy. Peptic ulcers are present at around 6%–15% of the population., Factors that increase risk of developing peptic ulcer include smoking, older individuals, O blood type, and stress. Peptic ulcers that tend to heal longer than duodenal ulcer are at higher risk of developing gastritis and gastric malignancy., Sign and symptoms of peptic ulcer may include one of the following; epigastric pain (strongly correlated to mealtimes), gastroesophageal reflux, dyspepsia, and melena (presence of blood in the stool). The two most common types of indigestions are peptic ulcer disease (PUD) and nonulcer dyspepsia (NUD). NUD is a prevalent disease in several countries such as Iran. Medication therapy is an effective treatment for peptic ulcer, and usually, combination of drugs is required for the ultimate effect. Patients should be able to tolerate medications and adhere to the prescribed regimen. Diagnosis test for H. pylori could be noninvasive methods such as stool antigen test and blood antigen test. However, the most accurate methods to detect H. pylori are invasive approaches that require histological examination after endoscopic biopsy as well as rapid urease test and microbial culture., Medications for treating peptic ulcer include one of the following drug categories; anti-acid drugs (e.g., magnesium hydroxide), proton pumps blockers (e.g., omeprazole), H-2 blockers (e.g., ranitidine and cimetidine), as well as cytoprotective agent (e.g., bismuth subsalicylate). Complications may include gastrointestinal bleeding (GIB), perforation, spillage of the acid or stomach content into the abdominal cavity, blockage of the stomach, and developing gastric malignancy. Serious complications include duodenal perforation, GIB, and gastrointestinal obstruction. Nowadays, surgical procedure for the treatment of uncomplicated peptic ulcer became obsolete. However, surgery typically is used in case of pyloric stenosis and drug-resistant peptic ulcers. There are several studies assessed cause and complications of peptic ulcers in Iran. In the previous meta-analysis done, prevalence of peptic ulcer in Iran was estimated, but the prevalence of peptic ulcer causes was not considered in this study. 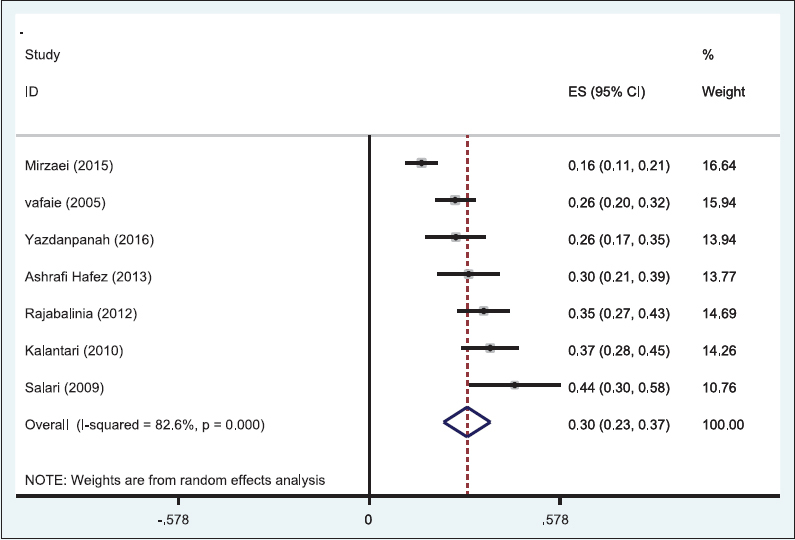 However, a meta-analysis is lacking to validate the results of existing knowledge and to open platform for potential use in the clinical practice and preventive medicine. The aim of this study is to determine cause and consequences of peptic ulcer in Iran, concerning the geographical area, age, and risk factors. 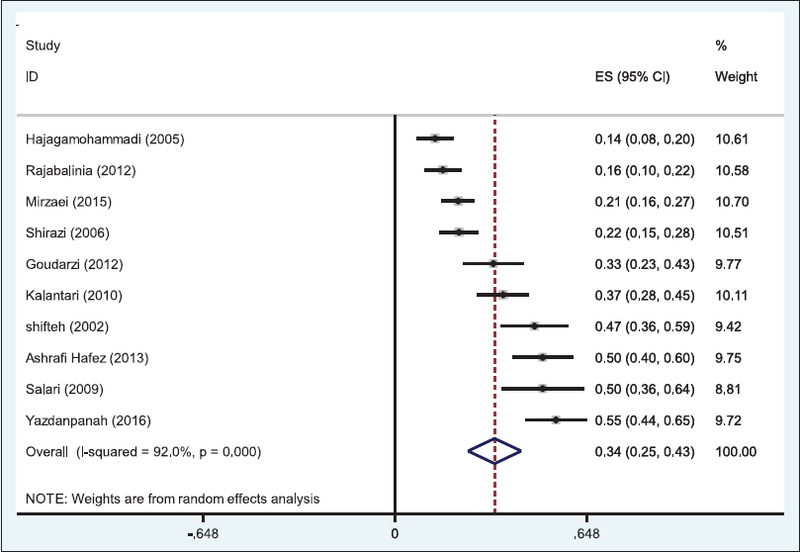 This is a systematic review and meta-analysis study of the literature on peptic ulcer. Electronic databases including Google, Google Scholar, Scientific Information Database, PubMed, Scopus, and Elsevier were searched for published articles in the Persian and English language. Several keywords were used for the search including peptic ulcer, prevalence peptic ulcer in Iran, cause of peptic ulcer, complications of peptic ulcer, and consequence of peptic ulcer. Two investigators independently collected initial list of studies with primary outcome of interest on peptic ulcer, cause, and consequences in Iran. Studies that assess solely treatment of peptic ulcer and risk factors were excluded from the list. A standardized data extraction template was used to provide a primary checklist of included studies. This checklist includes author name, title, year, location of study, sample size, population, gender, prevalence of peptic ulcer in total sample, prevalence of peptic ulcer among male and female, age category, and risk factors of peptic ulcer. The final checklist was generated by selecting studies that meet the criteria for the present meta-analysis. According to our strategy, 80 studies were included into the primary checklist and resulted into final inclusion of 50 articles for this study. However, 30 selected articles were checked again for the secondary outcome of interest, including sample size, time of data collection, and prevalence of peptic ulcer in Iran. Finally, 11 articles met the criteria to be included in the study and their full-text was assessed. 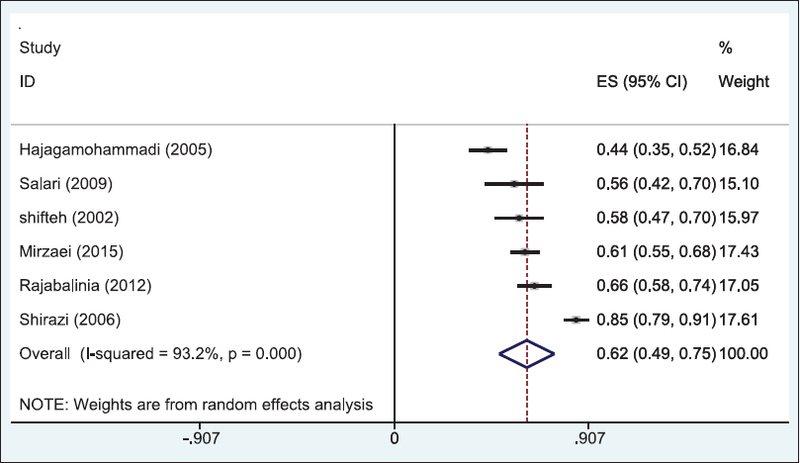 We preferred to use the binomial distribution of meta-analysis to model within-study variability. An overall prevalence is calculated as a weighted average of the individual studies. Each study weighted inversely proportional to its variance. We incorporated random effect model in this study due to significant heterogeneity index. Level of heterogeneity in this study was 89.6%, which indicates high heterogeneous studies. Heterogeneity <25% is defined as low heterogeneous, between 25% and 75% is defined as moderate heterogeneity falls, and more than 75% is defined as high heterogeneous. 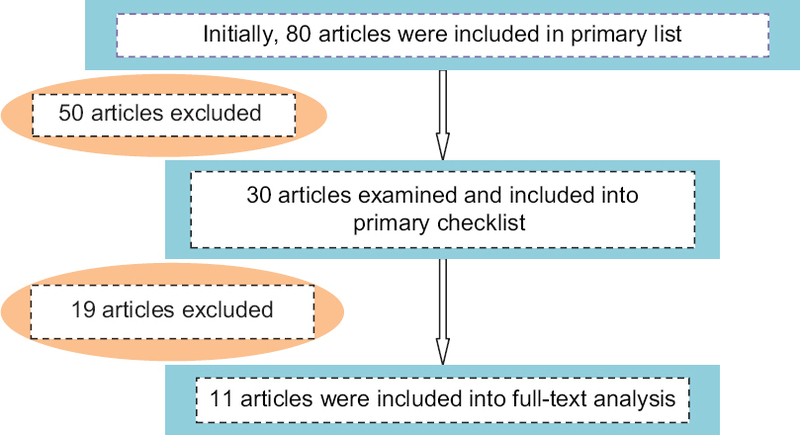 Systematic review of literature was conducted which yielded into identification of 80 articles. After careful consideration of titles and abstracts, 50 articles were included into the primary checklist. Finally, 11 articles met the inclusion criteria to be included into the final analysis of the current meta-analysis study [Figure 1]. The eleven eligible studies reported prevalence of peptic ulcer in Iran during 2002–2016 with total combined sample size of 1335 (121 sample per article). In terms of geographical distribution, 72.72% of the studies were conducted in central part of Iran (5 in Tehran, 1 in Qazvin, and 2 in Isfahan), 18.18% in the northwestern area (1 in Tabriz, 1 in Sanandaj), and 9% in the east area (1 in Kerman). Sampling method within the entire selected studies used selection from list of eligible individuals and all of the studies employed cross-sectional design. The 11 eligible studies reported prevalence and cases of peptic ulcer in general with the lowest prevalence in Qazvin (in 2005 and estimated to be 0.136) and the highest prevalence (0.545) in Sanandaj (2016). The characteristics of selected articles are presented in [Table 1]. The prevalence of peptic ulcer among women with 95% confidence interval (CI) was 30% (0.19–0.41) and among men with 95% CI was 60% (0.53–0.67) and average overall was 34% (0.25–0.43). The prevalence of peptic ulcer among women was 30% (95% CI = 0.23–0.37, I2 = 89.61, P < 0.001) and among men was 60% (95% CI = 0.53–0.67, I2 = 54.71, P < 0.05). However, the overall prevalence of peptic ulcer was 34% (95% CI = 0.25–0.43, I2 = 92%, P = 0.000). 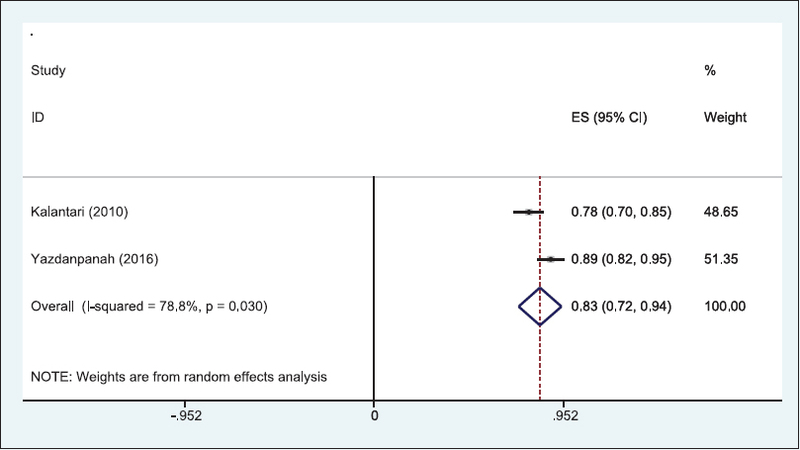 As a result of a significant heterogeneity (I2 = 89.6%), meta-analyses were conducted using the random effects model as depicted in [Figure 2]. In [Figure 3], the clinical manifestations of peptic ulcer have been reported and show that in 83% of patients, one or more of these clinical manifestations existed (epigastric pain, belching, histories, bloating, vomit, early fullness, anorexia, and nausea). In [Figure 4], the highest environmental factor (cigarette) has been addressed and 30% (95% CI = 0.23–0.37, I2 = 82.6%, P = 0.000) have smoked. In [Figure 5], the highest internal factor (H. pylori) was evaluated and the results showed that in 62% (95% CI = 0.49–0.75, I2 = 93.2%, P = 0.000) of patients, this bacterium was present. 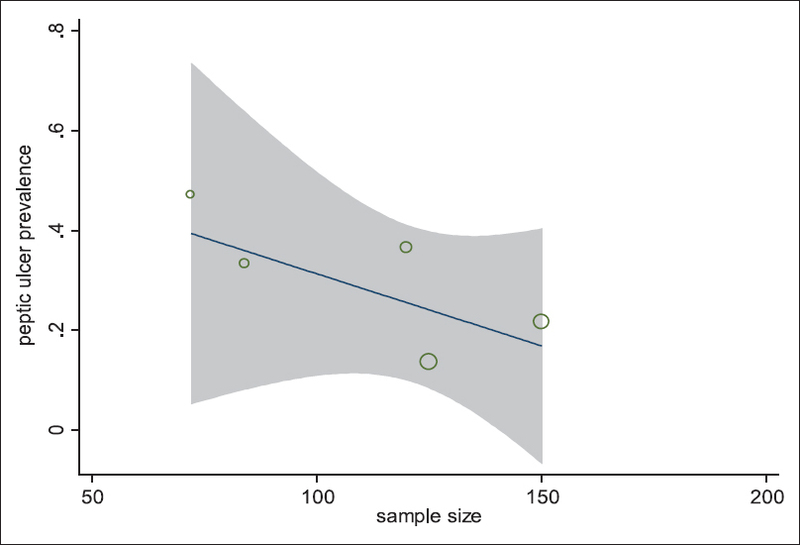 Meta-regression indicates that studies with low sample size reported higher prevalence and cases of peptic ulcer [Figure 6]. 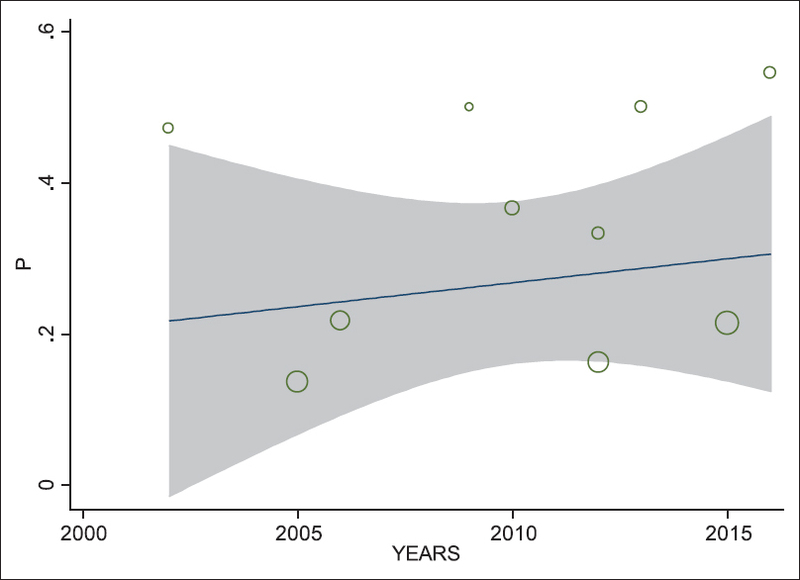 The prevalence and cases of peptic ulcer over time are shown in [Figure 7] with an increasing trend from 2002 to 2015. 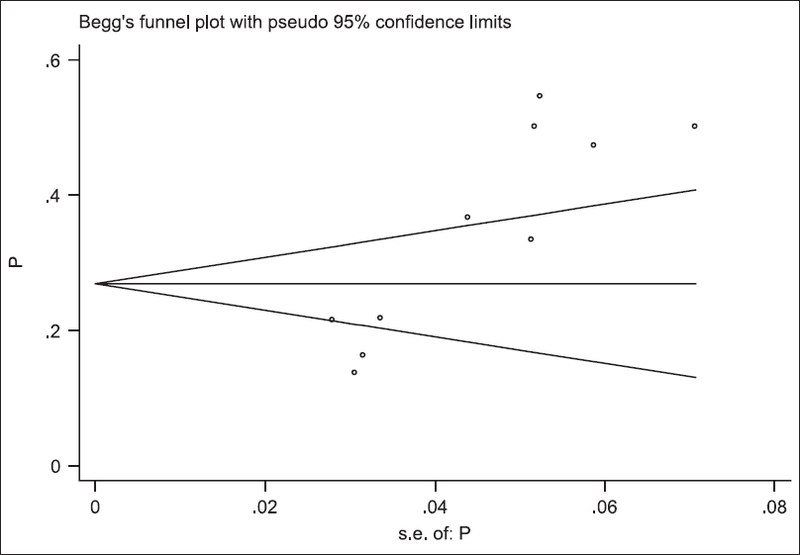 [Figure 8] depicts the symmetric funnel shape plot implying the absence of publication bias in this meta-analysis. According to our findings, 66.66% of the peptic ulcers were diagnosed through endoscopy and 33.33% through biopsy. The most vulnerable group for developing peptic ulcer was aged between 40 and 45 years and the frequent symptoms were epigastric pain and heartburn. The most vulnerable group for developing peptic ulcer was aged between 40 and 45 years which is in line with the previous evidence.,, We found an increasing trend in the prevalence of peptic ulcer over time from 2002 to 2015. In addition, we found that men are more likely to develop peptic ulcer compared to women. A possible explanation for this finding is higher rate of smoking among men, which eventually increase chance of developing peptic ulcer. Therefore, health promotion and empowerment programs to help individuals quit smoking may also play an important role in the prevention of PUD. Raise individuals' awareness on symptoms of peptic ulcer (epigastric pain and heartburn) helps them to seek care, which leads to early diagnosis and good prognosis. One of the environmental causes of peptic ulcer is smoking, which in the present study was 30% in patients with peptic ulcer. Smoking causes peptic ulcers and is more common in males,, which has led to a higher incidence of males than women, suggesting that cigarette smoking in males is reduced, and by educating and expressing the dangers of those people alert made. One of the causes of internal peptic ulcer is H. pylori. In the present study, it was 62% in patients with peptic ulcer. The presence of this bacterium almost determines the peptic ulcer.,,,, Many factors contribute to the growth of this bacterium and cause stomach ulcer disease. It is suggested that screening tests performed on an annual basis should be performed more accurately and sensitively to those who are prone to peptic ulcer to be identified earlier, to prevent the onset of the disease. There are several limitations in the selected studies for this meta-analysis including nonrandom sample selection, limited number of existing variables in the studies, and focusing on cause, consequence, and treatment of peptic ulcer without reporting its prevalence. In addition, there was no clear distinction between peptic and duodenal ulcer in some studies. We were not able to assess the prevalence of peptic ulcer in quintet geographical area of Iran (north, south, west, east, and center) due to the absence of conducted studies in all area. The prevalence of peptic ulcer in Iran (34%) is higher than average reported worldwide rate (6%–15%), and there is an increasing trend over time. Our results showed that men are more prone to develop peptic ulcer than women are. According to the results of the study, 83% of patients had clinical manifestations (epigastric pain, belching, histories, bloating, vomit, early fullness, anorexia, and nausea). One of the environmental causes of peptic ulcer is smoking, which in the present study was 30% in patients with peptic ulcer. One of the causes of internal peptic ulcer is H. pylori. In the present study, it was 62% in patients with peptic ulcer. The presence of this bacterium almost determines the peptic ulcer. Ilam University of Medical Sciences (ILUMS). Ghahramani R, Abbasian AS, Shafaee S. Prevalence of celiac disease in patients with different types of dyspepsia. J Isfahan Med Sch 2009;27: 64-73. Kalantari H, Nauruan SM. Prevalence of peptic ulcer versus non ulcer dyspepsia in patients which were admitted for endoscopy. J Isfahan Med Sch 2011;28:44-53. Abdollahi L, Zolfaghari MR, Amini M, Salehi R. The relation between microalbuminuria and Helicobacter pylori VacA gene in type 2 diabetic patients, Isfahan, Iran. J Isfahan Med Sch 2012;30:228-37. Tavan H, Sayehmiri K. Prevalence of peptic ulcer in Iran using the meta-analysis and systematic review. GOVARESH 2016;20:250-8. Talebi Bezmin Abadi A, Mohabati Mobarez A, Taghvaei T. An investigation of the prevalence of iceA genotypes in Helicobacter pylori strains isolated from peptic ulcer patients in Sari (2008). Arak Med Univ J 2010;13:84-90. Goudarzi H, Rezaee H, Rafizadeh M, Taghavi A, Mirsamadi E. The frequency of cagA gene of H. pylori isolated from biopsy specimen in Tehran during 2008-2010. Arak Med Univ J 2012;15:42-8. Karami L, Majd A, Mehrabian S, Nabiuni M, Irian S, Salehi M. Antimutagenic effects of ethanol and aqueous extracts of Avicennia marina leaves on Salmonella typhimurium TA100 bacterium. Arak Med Univ J 2013;15:68-76. Mousavi F, Rahnema M, Heydarieh N, Tajabadi Ebrahimi M. The effect of Iranian native Lactobacillus pentosus on healing of gastric ulcers in male Wister rats. Arak Med Univ J 2013;16:81-90. Salemi Z, Kamali Pooya S, Ghasemi M. Secretor status and some risk factors in duodenal ulcer, gastric ulcer, and gastric cancer. Arak Med Univ J 2013;16:45-51. Fazli D, Davarpanah Y, Amini B. Effects of examination stress on plasma levels of cortisol and hypertension. Sci J Ilam Univ Med Sci 2010;18:48-54. Esmailnasab N, Taymoori P, Darabi F. Comparison of quality of life 3 and 9 months after surgery in patients with gastrointestinal cancer. J Urmia Univ Med Sci 2013;24:226-34. Hajagamohammadi AA, Sheikholslami H, Esmaeili R. Prevalence of Helicobacter Pylori infection in different endoscopic lesions of patients in Qazvin Bouali Sina hospital (2002). J Qazvin Univ Med Sci 2005;9:68-72. Vahidi SH, Azadegan M, Shakeri A. Comparison of cytology and histopathology in the diagnosis of Helicobacter pylori infection in contact with the stomach biopsy specimens. J Fac Med Univ Med Sci Health Serv Martyr Beheshti 2002;26:241-3. Vafaie B, Golabi J. Surveying the association between life stresses and gastrointestinal diseases (peptic ulcer). J Fac Med Univ Med Sci Health Serv Martyr Beheshti 2004;28:285-9. Shirazi MH, Ghasemi A, Khoramizadeh MR, Ebrahimi N, Hosaeini M, Sadeghifard N. Detection of cagA gene in H. pylori strains isolated from patients with NUD, peptic ulcers and cancer by PCR. Sci J Ilam Univ Med Sci 2006;14:22-8. Yazdanpanah K, Parhizkar B, Sheikhesmaeili F, Roshani M, Nayebi M, Gharib F. Efficacy of zinc sulfate in peptic ulcer disease: A Randomized Double-Blind Clinical Trial Study. J Clin Diagn Res 2016;10:OC11-5. Seyed Mirzaei SM, Zahedi MJ, Shafiei Pour S. Prevalence of Helicobacter Pylori-negative, non-steroidal anti-inflammatory drug related peptic ulcer disease in patients referred to Afzalipour hospital. Middle East J Dig Dis 2015;7:241-4. Salari MH, Shirazi MH, Ahmmadi M, Hadaiti N, Daryani A. Frequency of Helicobacter pylori vacA genotypes in Iranian patients with gastric and duodenal ulcer. J Infect Public Health 2009;2:204-8. Rajabalinia H, Ghobakhlou M, Nikpour S, Dabiri R, Bahriny R, Jahani Sherafat S, et al. Non Helicobacter pylori, non-NSAIDs peptic ulcers: A descriptive study on patients referred to Taleghani hospital with upper gastrointestinal bleeding. Gastroenterol Hepatol Bed Bench 2012;5:190-6. Ashrafi Hafez A, Tavassoli E, Hasanzadeh A, Reisi M, Javadzade H, Imanzad M. Quality of life in peptic ulcer patients referring to Al-Zahra hospital of Isfahan, Iran. Gastroenterol Hepatol Bed Bench 2013;6 Suppl 1:S87-92.